Still a little too large for some, it's still a great device to help users enter the phablet market at a reduced cost. Update: The Samsung Galaxy Note 2 may be a few months old now, but it's been given some tweaks to make sure it can compete with the class of 2013, including an update to Android 4.1.2. We've updated our review accordingly. It hasn't even been a year since the original Samsung Galaxy Note launched. It was a work of genius for old Samsung. Many (including us, we admit) were not convinced. Who on earth would want something so big to make their calls and surf the internet, even with a glorified stylus? Millions of you, it would appear. The Samsung Galaxy Note has sold by the bucketload. And while it is most definitely a niche device, it's done wonders for Samsung's balance sheet. How do you follow that up? With something better, of course - the Samsung Galaxy Note 2. If you've ever fondled or caressed the original Samsung Galaxy Note and found its larger size too much to handle, we'll break this to you with a sledgehammer - the Samsung Galaxy Note 2 is bigger. It's now 151.1 x 80.5 x 9.4mm (5.9 x 3.2 x 0.4 inches), so slightly up from 146.9 x 83 x 9.7mm (5.8 x 3.3 x 0.4 inches). That said, we didn't find it cumbersome at all. In the way the original Samsung Galaxy Note followed the Samsung Galaxy S2's square design, the Samsung Galaxy Note 2 follows the Samsung Galaxy S3's more rounded rectangular look. And what a beauty it is. It actually felt slightly smaller to us in day-to-day use - but that may be down to the fact that we have gravedigger hands. The Samsung Galaxy Note had a frankly amazing screen as it was, so would have taken some beating. But Samsung clearly likes a challenge. The size has gone up slightly from 5.3 inches to 5.5. And although pixel density is reduced, we didn't notice it. This is the bright, vivid Samsung Super AMOLED panel that we all know and love - and what a beauty it is, replicating colours amazingly and immaculately. Side by side with the Samsung Galaxy S4, it may look a little less glam. But so will most phone screens. As expected, that screen takes up most of the front. You get a home button and two hidden soft keys beneath it as before, plus a front-facing camera and sensors up top. The handset itself has little to note (geddit?) around the edges. A headphone jack up top, power button on the right, volume on the left and charger port below, right alongside the S-Pen slot - more of which will follow later. Around the back, you'll find the 8MP camera with flash. The additional sorcery is carried out away from view. The microSD expansion slot is beneath the rear cover - as is the microSIM slot, hidden behind the enormous 3,100 mAh battery. And there's a whole lot of goodness even further inwards than that: HSDPA (LTE if you're extra lucky), NFC, GPS, Wi-Fi and so forth. It's a veritable treasure trove of geekdom. One other thing we'd say is that this does feel like a quality Android smartphone/tablet. We're aware of the protestations by some readers (particularly iPhone users) that phones such as the Samsung Galaxy S3 feel like toys because they're so light and plasticky. 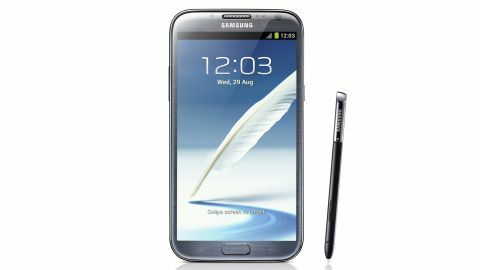 At 183g (0.4lbs), you couldn't describe the Samsung Galaxy Note 2 as a feather - and the weight gives it a real notion of substance. If you want to pick a Samsung Galaxy Note 2 up, you'll need to be willing to part with some serious cash. Although it has come down in price. From around £530/AU$999/US$700 SIM-free late last year, just a few months on, you can pick one of these up for as relatively little as £430/AU$700/US$615. It is also available on contract, but be willing to shovel £40+ per month in the network's direction for two years if you'd like the handset gratis in the UK. Normally, this is where we'd talk about the alternatives on offer. But we admit, we're stumped here. Why? Well, in our mind, there is no clear rival. The Samsung Galaxy Note created its own category, in that there were no real phablets about before. And while you'll get the Android 4.1 Jelly Bean operating system and similar benefits from the Samsung Galaxy S3 or Samsung Galaxy Note 10.1 (depending on whether you want a phone or tablet), the form factor is pretty unique. You can bring other larger handsets into the fold - like the Sony Xperia Z, for example - but they don't have an S-Pen or equivalent. In fact, the only real rival is the original Note - a worthy contender for that title because it's now available for a much reduced sum. Just £345/AU$500/US$450 SIM-free will get you one of those babies - and that makes it a very serious and credible alternative to its replacement, the Note 2. Though bear in mind, we are likely to see the Note 3 towards the end of the year, so the original will be way out of date by then.